An archive of reports from one of our fosterers, Jill, based in the Cambridge area. Jill's latest updates can be found here. Since becoming a fosterer from November 2009, I have had three pairs of cats plus a single male and at present have another single male. I am enjoying meeting all the lovely cats which have come into me so far, they have all shown their own character and I have been very lucky to have met some lovely friendly cats and enjoyed meeting the people who have come and given them nice homes, it is very rewarding. The first pair of cats were named Ted and Arthur who went to a nice lady in a village who said I was welcome visit them in their new home, which I enjoyed very much. The second pair of cats were called Tinkerbell and Memo who went to a nice couple in another village, which again, I had the pleasure of visiting, it was nice to see them settled in their new home. Toffee my latest cat was successfully re-homed in Cambridge by a nice couple who again invited me to visit them to see Toffee in his new home and I was pleased to see Toffee had settled in so well. Toffee was with me for nearly six weeks so it was not too long for him to find a nice new loving home. I feel I have had a good beginning since November as these cats have found nice new homes quite quickly, so I have had a good turnaround. My latest cat is named Oscar who was brought into me recently by a nice lady on behalf of the owner who can no longer look after him. He is a twelve year old grey male and is a very friendly sociable cat who is looking for a loving nice new home. I hope we can find the right home for him soon along with all the other cats and kittens in our care. I am enjoying being a fosterer, it is so rewarding to see all the cats and kittens finding loving new homes and meeting so many nice people along the way. I look forward to many more success stories. In November 2011, I will have been a Fosterer for the Cambridge Branch for two years and in that time, I have found it enjoyable and rewarding. Since my last piece on the Web-site back in August 2010, we thought it would be nice to update you on how I have been getting on with the cats that have come into me. The last cat that I had at the time of writing was Oscar who had come into me during July, 2010. 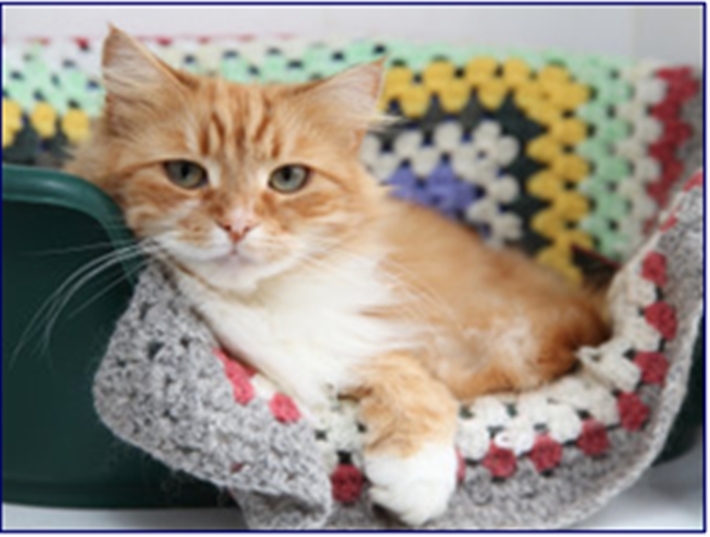 I am pleased to say, Oscar was found a lovely home in Cambridge by a lovely couple in October, 2010, so he was not in the cats pen for too long, I did visit him afterwards and he had settled in very well. Then came along Patch and Blackie, they were brought in by a lady who was having to move to rented property and therefore, could not take them with her. Patch was her first cat and Blackie was a stray cat who this lady was not going to keep but found that Patch and Blackie got on so well with each other that she had the two together. They were a lovely pair of cats and settled in the cats pen straight away and were always so friendly and seemed happy looking out of the windows, watching the birds etc. They were with me for eight months which was a very long time before the right people came long. This was a lovely family in a village who took to them instantly. They invited me to visit them in their new home and was very pleased to see they had settled in and were very happy and relaxed. When I left the house, the cats were sitting side by side on the settee ready for a cat nap. This again, was very rewarding to see, especially after eight months of being in the cats pen. People say to me, you must become very attached to all these cats especially the ones that are with me for any length of time. In reply, I always say, you do become very attached and miss them when they go, but I have to remember why I do what I do, and that is to find all these cats kind and loving homes and give them a chance of a new life which they deserve. I always do my best to look after them well while they are in my care and see them develop into their own characters. To bring you up to the present time, as I write this, my latest cat is named Thorn. He was a stray and was being fed by a Mr. Thorn, hence the name. He was rescued by Cambridge Cats Protection as it was felt he would benefit from a nice new home rather than being outside all the time with no proper home. He is a male Ginger, approximately one and a half years old. When Thorn first came to me on the 18th July, he was very nervous and would hide up in his igloo bed but after a day or so he would come out for his food and after about a week, he was coming out a lot more. He was rubbing round my legs, and then for no apparent reason, he would put is paw out and go for me. I must admit, I had a few scratches at first, but because he was a stray and nervous, it was not easy for him to adjust. I thought, I have just got to give him time to come out of his shell and gain confidence and sure enough, he certainly has. Thorn has been with me for just over two months at the time of writing this, and he is now so friendly, he eats every type of food I give him and he is purring and dancing, even when he is eating, he appears to be so much happier now and I hope the right person can come along and give him a loving home and give him all the time he needs to settle in again so he can bond with his new owners just the same as he has bonded with me. I am very pleased with the way he has come on and did not think it was possible to see such a transformation. I am still enjoying being a Fosterer and meeting all these lovely cats and look forward to looking after many more while they wait for their new homes and hope to report on some more success stories in the near future. I would like to bring you up date since my last piece on the web-site back in September 2011. You may remember I was writing a piece about Thorn, he was the male ginger who was very nervous at the beginning when he came to me last July and was totally a different, loving, and sociable cat after the first month of being with me. I am very happy to let you know, he was re-homed to a lovely lady in a village on the 17th November, 2011 and she invited me over to see him and I went in January of this year. Thorn had settled in very well and was so friendly when I saw him in his new home, the lady is delighted with him, I could not have wished for a better home for him, this is a real success story and I received some lovely pictures afterwards, especially of Thorn sitting in front of the fire, a very rewarding outcome for me to see. Next came along Tigger, a two year old male tabby, again a lovely cat who always seemed happy when he was here. He came 26th November last year and went to a nice lady in Cambridge on the 4th February this year. I have had contact since to let me know he has a new name, has settled in well and has made new friends and have some lovely pictures of him sitting on books, on top of doors etc. and also, unfortunately, I heard, he has been after the baby birds, but we have to accept, cats will be cats! He is a lovely cat nevertheless who deserved a good home. On the 21st February, 2012, Millie came to see me, a ten year old tortie, who looked so young. Again, such a friendly cat who needed a loving home, which I can tell you was reserved on the 9th March by a nice couple who were going on holiday and new exactly that Millie was the cat for them and came back to collect on the 20th March, which was just as well for me, it could not have worked out better, as Cats Protection were sorting out with different vets which we use, so therefore, Millie had not even been health checked or had a chance to get her photo on the web- site and had already been chosen from our Homing Officer's description, that's a first for me!. I telephoned Millie's new owners a week later, as we do with all our rehomed cats, and Millie was loving her new home, very well deserved for Millie and her new owners. At the time of writing this article, my latest addition is a lovely four year old male black and white cat who came to me, through no fault of his own at the end of March. Again, he is a lovely sociable, friendly boy who just needs a loving caring home he can call his own. He loves to be with people, loves his meals and loves doors, he is always getting into the porch in the cats pen, he likes to see what is on the menu for breakfast and teatime, so whoever adopts him needs to keep their doors tightly closed for the first three weeks as he is very alert. Please take a look on the adopt a cat pages: his name is Monty. 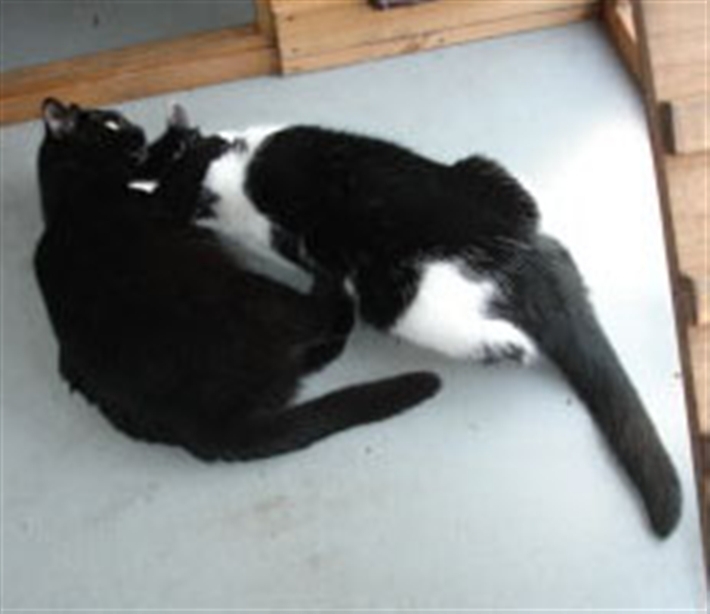 While you are there, I hope you will look at all our other cats and kittens who are looking for new homes and please ring 01223 528312 to ask about homing as not all our cats and kittens may be on the web-site. I am having a lovely time, meeting all the lovely cats and nice people and pleased to help out with other activities where I can. I will report on more success stories in the near future.